Have you seen these yet? 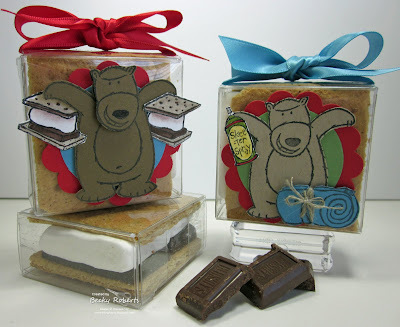 Flat marshmallows for s'mores! As soon as I saw them I knew exactly what to make...Camp kits to go!! Accessories: Hemp Twine, various Stampin' Write Markers, 1-3/4" Circle Punch, 2-3/8" Scallop Circle Punch, Marina Mist & Read Red Satin Ribbon. Clear boxes are from clearbags.com and are about 2-1/2" x 2-1/2" x 1". Oh my goodness, what a fabulous idea. 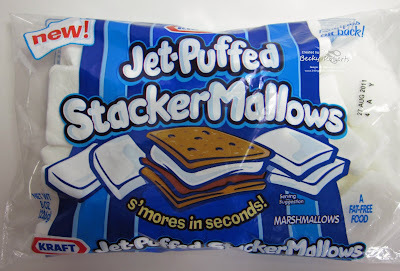 I have never seen those mallows, but will be on the lookout for them now. TFS. No way on those marshmallows! I need to be on the lookout for those! They are wonderful for your really cute project. Oh, where's the fun in a perfectly shaped marshmallow? What a cute kit, though! !